Parents Of Teen Who Defaced Egyptian Artifact Apologize : The Two-Way Internet sleuths traced the scrawl to a teenager in Nanjing. Cases like this have prompted a "tourism law" in China that seeks to make Chinese tourists better behaved abroad. 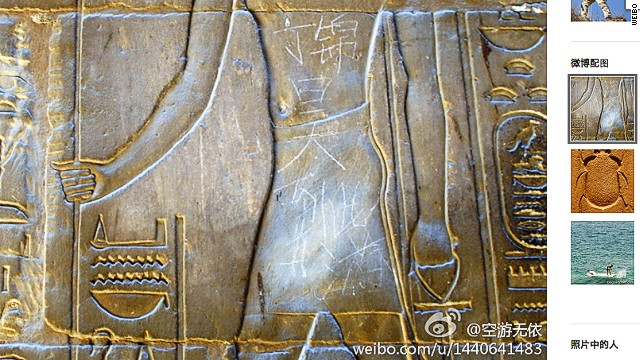 The graffiti on an Egyptian carving at the 3,500-year-old Luxor Temple reads: "Ding Jinhao was here." The parents of a Chinese teenager are not happy. Their 15-year-old son was found to have defaced an Egyptian artifact at the 3,500-year-old Luxor Temple. What's more, he did it using the most mundane of markings: Using what appears to be chalk, the boy wrote: "Ding Jinhao was here." According to CNN, another Chinese tourist saw the markings and uploaded a picture to the Chinese social network Weibo. "The saddest moment in Egypt," the tourist wrote. "I'm so embarrassed that I want to hide myself. I said to the Egyptian tour guide, 'I'm really sorry.' "
Within days, Internet sleuths traced the scrawl to Ding in Nanjing. China Daily reported yesterday that when his parents got wind of the vandalism, they issued an apology. "We want to apologize to the Egyptian people and to people who have paid attention to this case across China," the boy's mother is quoted as saying. China Daily says high-profile cases like this have triggered a new "tourism law" in China. It is scheduled to take effect in October and "will force some Chinese tourists to behave properly at tourist sites"
"Leaving graffiti is common among Chinese tourists, damaging historic sites and demonstrating poor education and behavior. "Yasser Hamed, the Egyptian tourist guide who led the tour on which Shen Yuwen discovered Ding's graffiti, said the boy may have noticed similar graffiti left as long ago as the early 20th century on the temple's walls, and thus may not have realized the gravity of his act. "The tourist guide who led Ding's group should also be blamed for not stopping such graffiti, according to Hamed."